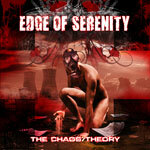 Edge Of Serenity's 'The Chaos Theory' came as a complete and most intriguing surprise. This Dutch band delivers an intriguing brand of melodic metal that had me scratching my head for classification. And that is something every band (metal or otherwise) wants to hear; none want to be pigeonholed, all want to be considered original. Edge Of Serenity easily and quite creatively blends the styles of melodic heavy metal, Euro power metal, symphonic/gothic metal, and thanks to the extensive use growling vocals, death metal into a compelling and entertaining package. It's probably best to call this simply progressive metal. Yet, the genuinely compelling edge to Edge Of Serenity is their continuous mix of styles into one harmonious whole. Songs like 'Dying Illusion,' 'The Downward Spiral,' or 'Endless Brutality' shift cleverly and frequently between types to keep your attention. For example, 'Endless Brutality' has deep foreboding passages mixed with subtle power metal moments and a rich vocal arrangement to be only one thing: progressive metal. For more friendly and accessible offering, Edge Of Eternity brings 'Born To Fall Apart, a basic symphonic gothic metal with lead vocals provided by Judith Stuber (Everon, Satyrian), and the hugely melodic 'Words From Within' with its strong keyboard presence. Edge Of Eternity's 'The Chaos Theory' is an impressive debut and an enjoyable slice of progressive metal which crosses many genres. Even with the abundance of growling death vocals, the arrangements are inviting and compelling. Very recommended. Edge Of Eternity's 'The Chaos Theory' is an impressive debut and an enjoyable slice of progressive metal which crosses many genres. Even with the abundance of growling death vocals, the arrangements are inviting and compelling.